Share the post "Exploring the Role of Relaxin in Neonatal Cervical Development"
Professor Carol Bagnell, chair of the Rutgers Department of Animal Sciences, was a member of the scientific committee that organized the 6th International Conference on Relaxin and Reated Peptides in Florence, Italy. 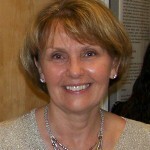 Bagnell, a longtime researcher on relaxin, chaired two sessions at the conference and presented “Biology of relaxin and its role in humans.” Her presentations included studies on the anti-arthritic effects of relaxin in joint and bone tissues and the importance of nursing and milk-borne relaxin for female reproductive tract development. Bagnell’s laboratory recently discovered that the development of neonatal cervical tissues is relaxin-sensitive and dependent on breastfeeding from birth. Presented at the international conference, these findings were published in the September 2012 issue of Endocrinology. Bagnell shares authorship in this publication with her former graduate students, Amy Frankshun (Ph.D. January 2011), Joseph Chen (Ph.D., October 2010), current graduate student Kathleen (Ferio) Rahman, an Endocrinology and Animal Biosciences major; former George H. Cook Scholar Lauren Barron, 2011 graduate of the School of Environmental and Biological Sciences; Teh-Yuan Ho —– and Frank Bartol, Auburn University. This research from the Bagnell laboratory was also highlighted in the October 2012 issue of The Endocrine Society’s news magazine, The Endocrine News, see “Trends”- page 7. See magazine extract below. Many experts recommend breast-feeding, especially the consumption of “first milk” or colostrum. Although nutritional and immunological benefits of nursing are well recognized, the role of colostrum as a conduit for delivery of milk-borne bioactive factors (MbFs), including hormones and growth factors, to neonates, termed lactocrine signaling, is less well defined. Scientists at Rutgers and Auburn Universities have been conducting research to determine the effect of lactocrine signaling on female reproductive tract (FRT) development.